CCTV or closed circuit television is a way to monitor security using video cameras and a DVR also known as a digital video recorder. iCCTV supplies and installs high quality security camera equipment at best prices, we provide economical surveillance systems packages. All of our CCTV installations come with warranty, we even have CCTV health check plans where our professional security system technician will come out to your property once a year to check the system is working correctly. 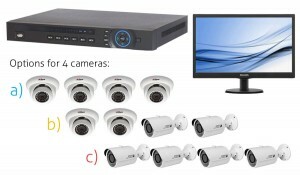 All of our security systems come equipped with cameras, a DVR and a display monitor.